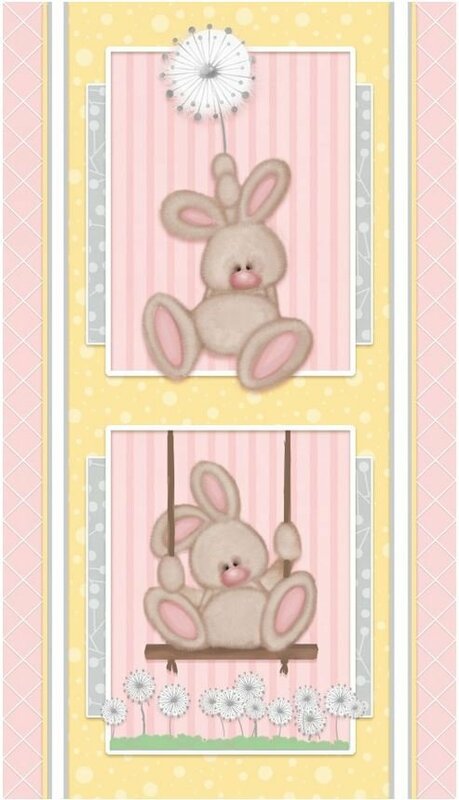 Brown bunny with dandelion puff and bunny on a swing in pink. Fluffy Bunny Quilt #1 and #2 Project Disclaimer from Henry Glass: Every effort has been made to ensure that all projects are error free. All the information is presented in good faith, however no warranty can be given nor results guaranteed as we have no control over the execution of instructions. Therefore, we assume no responsibility for the use of this information or damages that may occur as a result. When errors are brought to our attention, we make every effort to correct and post a revision as soon as possible. Please make sure to check henryglassfabrics.com for pattern updates prior to starting the project. We also recommend that you test the project prior to cutting for kits. Finally, all free projects are intended to remain free to you and are not for resale.